Photocopy of the original 1976 owner's manual instruction for the 16mm B&H 1585, 1590 and 1592 Autoload Filmosound movie projectors. 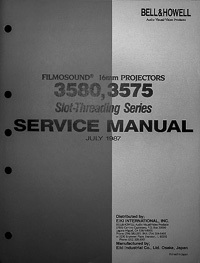 Photocopy of the original 1984 owner's manual for the 16mm B&H 2585, 2590 and 2592 Autoload Filmosound movie projectors. Photocopy of the original 1982 owner's manual for the 16mm B&H 2580 and 2582 Slotload Filmosound movie projectors. 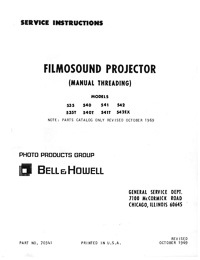 Photocopy of the original 1986 owner's manual for the 16mm Bell & Howell 2575 Slotload Filmosound movie projector. 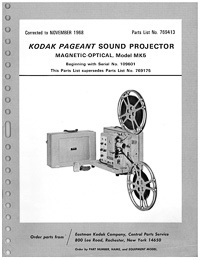 Photocopy of the original owner's manual for the Eiki 16mm Sound Movie Projector models NST and NT. Photocopy of the original owner's manual for the Eiki 16mm Sound Projector models RST, RT and RM. Photocopy of the original owner's manual for the Eiki Model EX6000 Xenon Lamp 16mm Movie Projector. 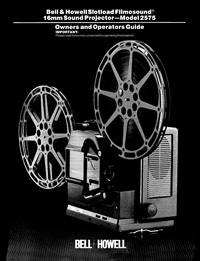 Photocopy of the original owner's manual for the Eiki 16mm Sound Movie Projector models SL-0, SL-1, SL-2, SL-0L and SL-1L. 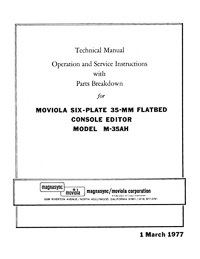 Photocopy of the original owner's manual for the Eiki 16mm Sound Movie Projector models ESL-0, ESL-1, ESL-2, SSL-0, SSL-1, SSL-2 and SSL-0L.